Last month on Dice Hate Me, I published an interview with Clever Mojo Games‘ owner and publisher W. David MacKenzie and board game designer Tory Niemann about their upcoming strategy game Alien Frontiers. I recently spoke with MacKenzie about the status of production, availability schedule and advanced buzz for the game. 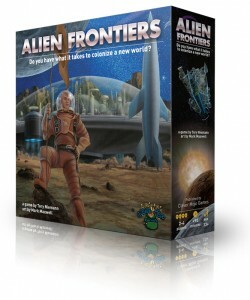 Clever Mojo Games expects to receive the full shipment of Alien Frontiers from the printer by October 12th. Kickstarter backers and customers who have pre-ordered the game should begin receiving their copies by the end of October. Although it is too late to contribute to the Alien Frontiers‘ Kickstarter campaign and obtain the exclusive Alien Tech card, anyone can still pre-order the game for $39.95 on the Clever Mojo Games website and save $10 off the regular, retail price of $49.95. Currently, Alien Frontiers will not be available from any traditional retailers since it has a small initial print run. However, Clever Mojo Games is offering wholesale prices for any retailers who may be interested in selling the game in their stores. If you’d like to see your friendly local game store support small publishers, mention Alien Frontiers to them. Alien Frontiers looks to be as fun and unique a playing experience as I had hoped. Advanced buzz for the game is very positive, and several reviews have given it high marks. Matt Drake at Drake’s Flames had this to say: “It’s fast, smart, fun and pretty, and is a definite sign that Clever Mojo Games is going to be a serious contender in the endless contest to gobble up our gaming dollars.” The Game On! with Cody and John podcast also doled out some Alien Frontiers love, even publishing a rare, written review for the game and rating it a 9 out of 10. With praise like that, it’s hard to imagine that this small-press wonder will disappoint once it’s on the table. Alien Frontiers is definitely one of the new games I look forward to playing. Be sure to check back here in November for my review. Want the latest updates on new game reviews, news, and somewhat-humorous ramblings on Dice Hate Me? Join the email list revolution!